Over the years many members of this forum have sung the praises of Steve Osborne of The Reel Image . We all know him as a kind, friendly, and scrupulously honest businessman, and a true friend of film collectors everywhere. The term 'bad deal' does not exist when dealing with Steve, he unfailing supplies 100% customer satisfaction, and more often than not 150%. So here is my latest example of Steve's thoughtful and kind support of his customers. Last week I posted on this forum that I was looking for the box cover graphic of the WDHM print of The Band Concert. Thomas Knappstein kindly sent me a jpg file that I was going to use to dress up the very tatty box in my possession of this film. Fast forward to todays US postal delivery. There in my mail box is a package from Steve containing a very nice box of The Band Concert! Steve had apparently read my forum post and thrown this in the mail. Well thanks so much to Steve once again! Steve O. is kind of our "silent member": he has done similar things for me many times. Some years ago he replied to a couple of my own Forum posts by postcard! It was a nice surprise among the bills and the junk mail. I haven't missed very many Cineseas (Yes: "CineSea" has a plural!) I did miss CineSea 5, the one where Steve Osborne was the special guest. I really wish he'd attend another one! Steve is a wonderful person whose kindness and faith in others has occasionally been taken advantage of. Shipping a print out after accepting partial payment and then never seeing the balance paid off has unfortunately happened more than once. If those involved should happen upon this thread, it really would be in their best interests to settle up. Steve is a great guy and great friend. I am fortunate to live close (3 hours away) so I attend his annual film shows and they are always a blast! Always has great deals on films and equipment. I am always happy to see a package from The Reel Image on my front porch! Steve is a true gentleman. I have had the privilege of meeting with him on two or three occasions in Ohio. Really enjoy his print magazine. Never had a bad dealing with steve he’s a gentleman and a scholar. He even reminded me that I needed to pay for a film I had bought from him. All that has been stated about one Steve Osbourne is absolutely true and accurate! Steve is a truly decent fellow. I'm sad to hear that some folks have NOT been as decent to him at times. Its was a reel treat to meet him (with David Baker) at his home and watch movies in his theater.Such a great guy who loves the hobby and passes the love onto others.Makes everyone feel special. I always look forward to receiving films and his mailings. I am A Hitchcock fan and Steve has really been amazing getting these prints for me. Recognition for Steve has been long overdo on this forum ! Probably THE most charitable collector in our field , Steve believes in the preservation of the film hobby and strives to keep it alive . Just take a look at a copy of his REEL IMAGE magazine and you'll see why . Go to : thereelimage.jimdo.com , get on his mailing list ! Thanks to him , my Super 8mm film collection has grown by 100% , just in the past year . Currently my company ( Ohio Film Collector Exchange ) is working with Steve on a couple of film projects and coordinating with him for a special Fall out - door film presentation this September . You can check back on this Forum OR Steve's website mentioned above , when it's time to announce it . HANG IN THERE FILM FANS ! Thanks to all of you Forum members that have taken the time to show appreciation to a true " film preservationist " , one that is so needed in this digital age . Thought I'd chime to applaud Steve's wonderful sense of humor. His website is full of the greatest puns and hilarious animations. Plus, while never expected, it's always a delight to find a little extra surprise in his orders! And lastly, I share his adoration for Peter O'Toole! It's sad that some people take advantage- name another vendor - in ANY hobby - that doesn't demand payment upfront! I can echo all the sentiments regarding Steve Osborne. If anyone one person was to be picked as the true voice of this hobby, it would be him. Totally agree with all comments too, and thanks for starting the thread, Paul. Amazing generosity, kindness and trust from Steve. He's found me films that I never thought I'd come by, and he always does something beyond the call every time I deal with him. 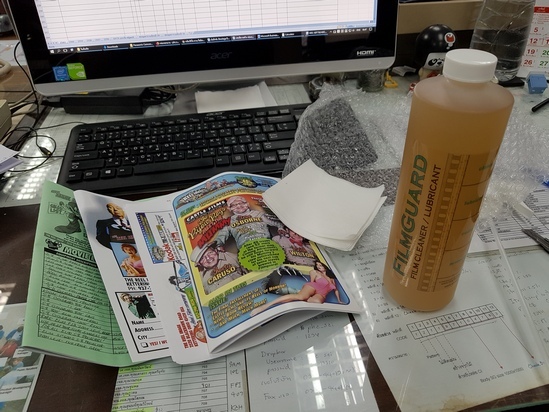 Placed an order for a bottle of FILMGUARD for my fellow collector here. But the item arrived within LESS THAN A WEEK! I was told that liquid cannot be sent via air mail now...so how can you get that? Winbert, I've also got Filmguard from Steve shop, I'm waiting for the package. Perhaps, it's a cleaner with particular (more safer) mixture that can be sent despite the more restrictive laws of today. Go easy, there's no problem with Steve shop! I remember that a cleaner in Europe could no longer be shipped beyond the country of residence, but I don't remember what it was. Nantawat, it's a large bottle? I bought 16 oz version. Steve sent FilmGuard to me in the UK. Only took about a week. I'd love to order from the official Film Tech's Amazon store,but since it's undeliverable to my region while Steve somehow managed to ship this overseas. So this is no-brainer for overseas collectors,of course. Ah, 16oz, I thought 32. It looks big in picture! It has to do with the kind of chemicals. Film Renew can not, Filmguard can. And yes, only had my fist order and chat with him , and Steve was very friendly indeed. If I had ten thumbs, they all would be up for Osborne.